bibliography * The PainScience Bibliography contains plain language summaries of thousands of scientific papers and others sources, like a specialized blog. This page is about a single scientific paper in the bibliography, Lin 2019. Lin I, Wiles L, Waller R, Goucke R, Nagree Y, Gibberd M, Straker L, Maher CG, O\textquoterightSullivan. What does best practice care for musculoskeletal pain look like? Eleven consistent recommendations from high-quality clinical practice guidelines: systematic review. Br J Sports Med . 2019. PainSci summary of this paper?This page is one of thousands in the PainScience.com bibliography. It is not a general article: it is focused on a single scientific paper, and it may provide only just enough context for the summary to make sense. Links to other papers and more general information are provided at the bottom of the page, as often as possible. ★★☆☆☆?2-star ratings are for studies with flaws, bias, and/or conflict of interest; published in lesser journals. Ratings are a highly subjective opinion, and subject to revision at any time. If you think this paper has been incorrectly rated, please let me know. Care should be patient centred. This includes care that responds to the individual context of the patient, employees effective communication and uses shared decision-making processes. Screen patients to identify those with a higher likelihood of serious pathology/red flag conditions. There has been an unsatisfactory response to conservative care or unexplained progression of signs and symptoms. It is likely to change management. Undertake a physical examination, which could include neurological screening tests, assessment of mobility and/or muscle strength. Patient progress should be evaluated including the use of outcome measures. Provide patients with education, information about their condition and management options. Provide management addressing physical activity and or exercise. Apply manual therapy only as an adjunct to other evidence based treatments. Unless specifically indicated (e.g. red flag condition), offer evidence-informed non-surgical care prior to surgery. Facilitate continuation or resumption of work. Many of these are routinely neglected by family doctors and healthcare professionals with minimal training, like many massage therapists, who can be forgiven for not being musculoskeletal medicine experts, regrettable as it is. Unfortunately, this paper is newsworthy because so many of these best practices are actually neglected by — or even at odds with — the common beliefs and practices of healthcare professionals who should know better. For instance, the importance of psychosocial factors is either entirely neglected or hotly contested by many; or, even more common, it is paid lip service but given short shrift in practice. There is an immense gap between theory and practice in musculoskeletal medicine, with vast numbers of professionals perpetually indulging in pet theories of pain and wildly overestimating the value of passive therapies — the power of gadgets, tools, and hands — while underestimating and neglecting everything else. Not that it’s a perfect list! There are problems here too. The consensus of several recent clinical practice guidelines is not necessarily the last word, and I would hope that the same review would have some different results ten years from now. Objectives: To identify common recommendations for high-quality care for the most common musculoskeletal (MSK) pain sites encountered by clinicians in emergency and primary care (spinal (lumbar, thoracic and cervical), hip/knee (including osteoarthritis [OA] and shoulder) from contemporary, high-quality clinical practice guidelines (CPGs). Design: Systematic review, critical appraisal and narrative synthesis of MSK pain CPG recommendations. Eligibility criteria: Included MSK pain CPGs were written in English, rated as high quality, published from 2011, focused on adults and described development processes. Excluded CPGs were for: traumatic MSK pain, single modalities (eg, surgery), traditional healing/medicine, specific disease processes (eg, inflammatory arthropathies) or those that required payment. Data sources: Four scientific databases (MEDLINE, Embase, CINAHL and Physiotherapy Evidence Database) and four guideline repositories. Results: 6232 records were identified, 44 CPGs were appraised and 11 were rated as high quality (low back pain: 4, OA: 4, neck: 2 and shoulder: 1). 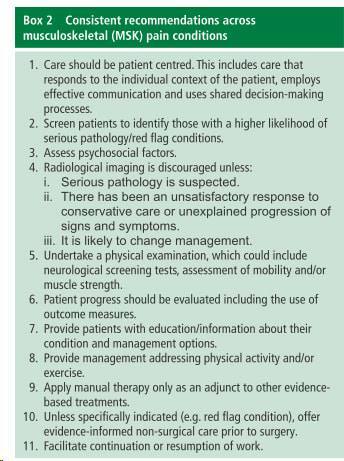 We identified 11 recommendations for MSK pain care: ensure care is patient centred, screen for red flag conditions, assess psychosocial factors, use imaging selectively, undertake a physical examination, monitor patient progress, provide education/information, address physical activity/exercise, use manual therapy only as an adjunct to other treatments, offer high-quality non-surgical care prior to surgery and try to keep patients at work. Conclusion: These 11 recommendations guide healthcare consumers, clinicians, researchers and policy makers to manage MSK pain. This should improve the quality of care of MSK pain.